First and foremost, Helicon is dedicated to showcasing creative talent and keeping you up-to-date with local events and exhibitions. Helicon's online presence consists of our blog, Twitterand Facebook page, each of which are updated regularly by our editorial team. Bringing you reviews, interviews and features, as well as a stream of ramblings, our blog encompasses everything from Bristol’s local scene to the creative world at large. 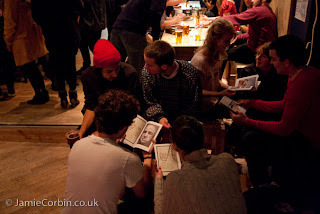 This year we plan to hold more meetings and establish Helicon as a creative society. It will be an opportunity for all members, and anyone interested in the creative arts, to meet on a regular basis and explore Bristol. We will also send regular emails telling you about local art exhibitions, gigs and events. We are an unintimidating bunch who always love to hear from you. Our task is to look for what is successful in a piece and provide feedback even if it doesn’t make it into the magazine. We will also happily provide you with all the guidance and editing advice you want. In fact, every submission receives detailed and helpful feedback from our editors. Remember, Helicon isn't just for students; everyone and anyone is invited to join our ever-expanding Creative Collective. 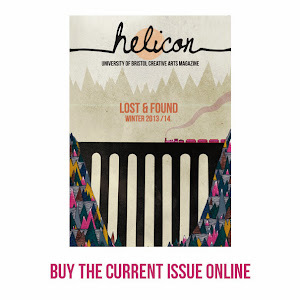 If you'd like to get involved or submit your work for the magazine or blog, send an email to helicon.magazine@gmail.com with 'submission' as the subject.